From our humble beginnings as a small discount retailer in Rogers, Ark., Walmart has opened thousands of stores in the U.S. and expanded internationally. Through innovation, we're creating a seamless experience to let customers shop anytime and anywhere online, through mobile devices and in stores. We are creating opportunities and bringing value to customers and communities around the globe. 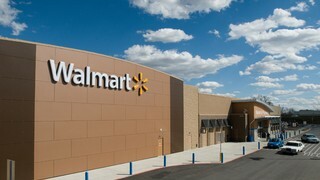 Walmart operates over 11,300 stores under 58 banners in 27 countries and eCommerce websites in 10 countries. We employ approximately 2.2 million associates around the world — 1.5 million in the U.S. alone. Every day low prices on a broad assortment - anytime, anywhere. Every Day Low Price (EDLP) is the cornerstone of our strategy, and our price focus has never been stronger. Today's customer seeks the convenience of one-stop shopping that we offer. From grocery and entertainment to sporting goods and crafts, we provide the deep assortment that our customers appreciate -- whether they're shopping online at Walmart.com, through one of our mobile apps or shopping in a store. We currently operate three primary store formats in the U.S., each custom tailored to its neighborhood. Greg Foran is Walmart U.S. President & CEO. A job at Walmart means an opportunity to build a career. About 75% of our store management teams started as hourly associates, and last year, we promoted about 200,000 people to jobs with more responsibility and higher pay. In the U.S., the average, full-time hourly wage is $14.06. Learn more about the opportunities and benefits we offer, as well as our commitment to hire 250,000 veterans. Walmart gives back to every community in which it serves. Learn more about the Walmart Foundation and our $2 billion commitment to fight hunger in the U.S.
Walmart is the largest onsite green power generator in the U.S. Learn more about our sustainability initiatives in the United States and around the world. 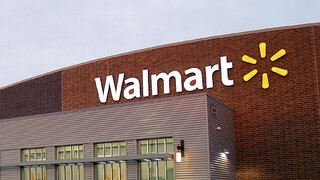 Walmart has stores in 50 states and Puerto Rico offering low prices on the broadest assortment of products through a variety of formats including the Supercenter, Discount Store and Neighborhood Market. Learn more about our locations. 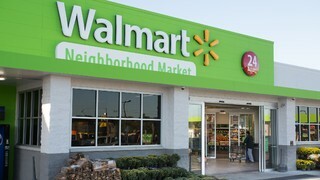 Walmart began building Supercenters in 1988 and are around 182,000 square feet employing about 300 associates. Walmart Supercenters offer a one-stop shopping experience by combining a grocery store with fresh produce, bakery, deli and dairy products with electronics, apparel, toys and home furnishings. Most Supercenters are open 24 hours, and may also include specialty shops such as banks, hair and nail salons, restaurants, or vision centers. Since Sam Walton opened his first discount store in Rogers, Ark., in 1962, we've built hundreds across the U.S. Smaller than a Supercenter, discount stores employ about 200 associates and offer electronics, apparel, toys, home furnishings, health and beauty aids, hardware and more in about 106,000 square feet of open, brightly lit space. Walmart Neighborhood Markets were designed in 1998 as a smaller-footprint option for communities in need of a pharmacy, affordable groceries and merchandise. Each one is approximately 38,000 square feet and employs up to 95 associates. Walmart Neighborhood Markets offer fresh produce, meat and dairy products, bakery and deli items, household supplies, health and beauty aids and a pharmacy. Walmart's 150+ distribution centers are hubs of activity for our business. Our distribution operation is one of the largest in the world servicing stores, clubs and direct delivery to customers. Walmart transportation has a fleet of 6,100 tractors, 61,000 trailers and more than 7,800 drivers. The distribution center network ships general merchandise, dry groceries, perishable groceries, along with other specialty categories to our consumers daily. There are 6 disaster distribution centers, strategically located across the country and stocked to provide rapid response to struggling communities in the event of a natural disaster. Each distribution center is more than 1 million square feet in size and employs 600+ personnel unloading and shipping over 200 trailers daily. Every distribution center supports 90 to 100 stores in a 150+ mile radius. 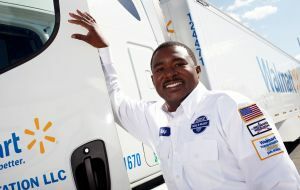 Walmart is able to move goods to and from distribution centers because we maintain a private fleet of trucks and a skilled staff of truck drivers. We think our team of drivers is the best in the world. They're part of one of the largest and safest fleets, and every year they drive 700 million miles to make millions of deliveries to our stores and clubs. Each driver averages around 100,000 miles annually-that's like driving around the world 4 times! Together with our truck drivers, we're constantly working to ensure that we're moving merchandise in responsible, sustainable ways. Drivers follow the most efficient routes to their destinations and work to minimize the number of "empty miles" they drive. This way, we use less fuel, we drive fewer miles and we maximize the merchandise we deliver while minimizing our environmental impact. By reducing the "empty miles" driven and other optimization techniques, Walmart logistics hauled over 161 million more cases while only increasing miles by 24 million, compared to last year. We improved the efficiency of our truck fleet by 87.4% in 2014 compared to 2005. Learn more about our sustainability efforts. Around the world, we help families save money so they can live better. We use our size and scale to provide access to high-quality goods and fresh, nutritious food at everyday low prices—while creating opportunities for our associates and small and medium-sized global suppliers. Led by President & CEO Judith McKenna, Walmart International has more than 5,900 retail units, operating outside the United States with 55 banners in 26 countries with more than 700,000 associates serving more than 100 million customers every week. Read more about how we operate around the world. Learn about some of our most important social, environmental and company initiatives within each market we serve, as we bring value to customers and communities in our Global Responsibility Report. Sam Walton opened the first Sam's Club in 1983 to help small business owners save money on merchandise purchased in bulk. Since then, Sam's Club has grown rapidly to serve families and entrepreneurs through nearly 600 clubs in the U.S., more than 200 international clubs, SamsClub.com and mobile applications. Today Sam’s Club is committed to becoming the membership you love the most by saving members money on the items they buy most and surprising members with the unexpected find –anywhere, anytime. Sam's Club employs about 100,000 associates in the U.S. The average club is 134,000 square feet and offers a highly curated assortment of quality fresh food and Member's Mark items, in addition to market leading technologies and services like Scan & Go, Club Pickup and home delivery service in select markets. Sam’s Club also offers specialty services, including travel, auto buying, pharmacy, optical, hearing aid centers, tire and battery centers and a portfolio of business operations support services. The president & CEO of Sam's Club is John Furner. Find a club or shop our products online. Major innovations. Massive scale. Imagine the possibilities. Did you know the world's largest brick-and-mortar retailer is also one of the fastest growing and most dynamic e-commerce organizations? Led by Marc Lore, founder and former chief executive officer of Jet.com, we're creating an experience that lets customers shop anytime, anywhere — delivering exactly what they want, when they want it. Want to join the team that's changing the way the world shops? Learn more about Walmart eCommerce careers. Our largest website, Walmart.com, sees up to 100 million unique visitors a month, according to comScore, and is growing every year. With our mobile apps, Easy Reorder and shipping options like Free Two-Day Shipping and Pickup Discount, we’re providing customers with more ways to save time and money while reimagining how digital and physical shopping work together. 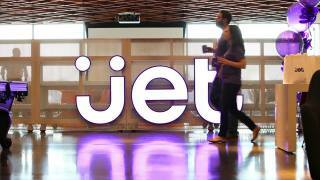 In 2016, Walmart acquired Jet.com and began expanding its portfolio of e-commerce sites. 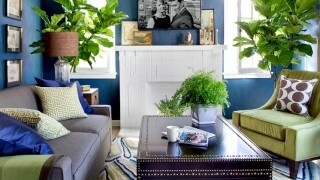 As part of the Jet acquisition, Hayneedle.com (home furnishings) also joined our family. In 2017, Walmart added Shoes.com (footwear), Moosejaw (outdoor apparel and gear) ModCloth (women’s apparel) and Bonobos (men’s apparel) to the portfolio. The result? An unparalleled selection of brands and categories, and a family of sites that provides a great end-to-end experience for customers. Jet is among the fastest growing and most innovative e-commerce companies in the U.S. With a growing customer base of urban and millennial customers, Jet uses best-in-class technology that rewards customers in real time with savings on items that are bought and shipped together. Jet is headquartered in Hoboken, New Jersey. Hayneedle, founded in 2002, is a leading online home furnishings and decor retailer that includes the world’s largest outdoor living selection. With over 3,000 brands, Hayneedle is a go-to source for furniture, decor, exclusive designs and more for every space, style and budget. Hayneedle is headquartered in Omaha, Nebraska. Moosejaw, founded in 1992, is a leading online active outdoor retailer with a large web presence as well as 10 physical stores. Moosejaw carries more than 400 brands and offers an extensive assortment of apparel and gear for activities such as climbing, hiking, camping, snow sports, yoga, swimming and biking, among others. Moosejaw is headquartered in Madison Heights, Michigan. Shoes.com, founded in 1999, is a leading online footwear, clothing and accessories retailer. 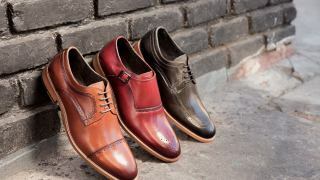 Shoes.com carries more than 800 brands and over 1 million items including footwear for women, men and kids, as well as clothing and accessories, such as outerwear and handbags. Shoes.com is headquartered in Boston. ModCloth, founded in 2002, is a fashion retailer beloved by millions of women for pioneering inclusivity and body positivity in the U.S. fashion industry. As one of the top specialty fashion sites with a strong social media presence and highly engaged community, ModCloth also operates one physical store in Austin, Texas. ModCloth is headquartered in San Francisco with additional offices in Los Angeles and Pittsburgh. Bonobos, founded in 2007, is one of the largest clothing brands ever built on the web specializing in men’s clothing. Based in New York City, Bonobos operates a unique retail model including 45 completely personalized retail stores, called Guideshops, coupled with an engaging e-commerce platform. Known as the retailer with the perfect fit and customer service ninjas that exceed expectations, Bonobos makes shopping painless, and maybe even fun. Walmart App - Shop our large assortment anytime, anywhere from the palm of your hand. Walmart Grocery - Order fresh groceries online online with same-day pickup. We’ll even load your car. Easy Reorder - A single-spot view that makes it easy to reorder your favorite items purchased at Walmart and Walmart.com. Walmart Pay - Pay for store purchases directly from your mobile device, all without reaching for your wallet. Pickup Discount - Order online, pick up in store for even lower prices. Free Two-Day Shipping - Choose from millions of select items online - no membership needed. Free on orders of $35 or more. For our customers, it’s as easy as a tap on their screen. But what goes on behind the scenes? The short answer: a ton of people power, highly-efficient fulfillment campuses dedicated to e-commerce, a world-class transportation fleet, and a touch of magic. With cutting-edge systems and unrivaled scale, we’re able to serve customers quickly and offer more choices for how they’d like to receive their orders — shipped to their homes or picked up at their local stores for free. Our newest e-commerce fulfillment centers are capable of shipping and handling millions of items. Our fulfillment centers are strategically located across the U.S. to give us efficient access to 98% of U.S. customers in two days or faster using ground shipping. Each fulfillment center is unique and designed with special characteristics based on the area where it’s located. For example, our fulfillment center in Davenport, Florida, has 62 dock doors that can withstand wind speeds of 120 mph due to hurricane risk. We’ve created a separate team, Store No 8, that’s dedicated to uncovering, inventing and investing in the ideas that will transform the future of commerce. As a stand-alone team based in Silicon Valley, this incubation hub has created an ecosystem where new ideas can thrive outside the existing definitions of retail. Named after an early store remembered by Sam Walton as an “experiment,” Store No 8 is where “crazy ideas” are the norm — where teams of passionate people are placing bets to change the future of retail.